You can download the viewing activity for any profile as a CSV file to easily see which titles were watched and when. The oldest on my list (Remember The Titans) was from January 5th, 2009, which is 3,596 days ago. Almost ten years! Binge watched seasons 1 and 2 of Marvel’s Daredevil on Netflix over nine days. Loved the first season, and thought the second season was better. Character development was mature, so storylines and action sequences felt more intense. Definitely worth watching. Next to watch: Marvel’s Jessica Jones. I ordered the Netflix Player by Roku as a late Christmas present for my mom. I’ve had Netflix for over a year, but sometimes we have those days (weekends) where two movies won’t cut it. The appeal to this device is simplicity because my mom is completely illiterate when it comes to technology. It took less than five minutes to plug in, connect to my wireless router and enter the activation code on the Netflix website. I had already queued up a bunch of movies I thought my mom would want to watch. She mentioned “The Bone Collector” the other day, so that christened the Netflix Player. We have a flat screen tube television. I connected the Netflix Player using the composite video and stereo inputs. We don’t have a LCD high definition TV or surround sound. Our internet connection is 3 Mbps (minimum 1.2 Mbps required). Considering what we’ve got, I’m very pleased with the quality. Wow. The user interface is amazingly simple. Queue movies into the Instant queue through the Netflix website, then they’re available to watch from the Netflix Player. Instantly. After watching a movie or TV show, I can just remove it from the Instant queue without needing to visit the website. Once I pick a movie and press play, it took 45 seconds to buffer. After that, I didn’t notice any stuttering. To try the resume feature, I paused once in the movie and went back into the main menu to navigate around for a bit. Resuming play took about 45 seconds. I paused the movie to go back a few seconds in the movie and it took 20 seconds to resume play. To pause and resume, it’s instant. At the time of this writing, Netflix has 100,000 DVD titles and 12,000 choices that can be watched instantly. Most of those 12,000 are older movies, but there are some new ones. I’m not sure why some movies are available while others aren’t. Spider-Man 3 is available, but Spider-Man and Spider-Man 2 aren’t. National Treasure: Book of Secrets is available, but National Treasure isn’t. In any case, I figure that by the time I see those 12,000 titles, hopefully 50,000 more will be available. This is the simplest and least expensive way to have access to lots[1. I didn’t say comprehensive.] of on-demand movies and TV episodes. Although you’re tethered to $8.99/month (the cheapest unlimited Netflix plan), that’s much cheaper than cable or satellite. Sure it’s only been two days, but I think the Netflix Player rocks. 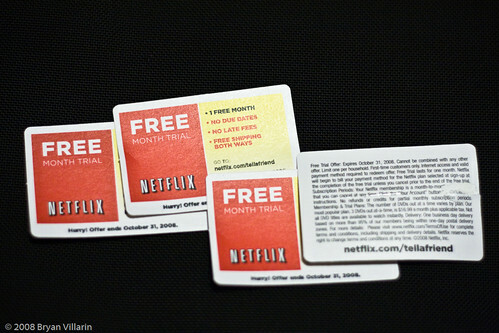 If you haven’t tried Netflix, they’ve sent me[1. and I’m sure lots of other members] four gift cards for a free month trial. The catch is that you need to be a first-time customer and that it’s limited to one per household. Leave a comment if you want a code. I have four to giveaway. At 12:00pm PST on Friday, September 26th, 2008, I’ll pick the four using the Random Integer Generator from RANDOM.ORG. Update 9/29/08: So much for that. Not many people need these. Oh well. Just so you know, I now have two left. Update 11/20/08: These expired on October 31st, so…yeah. Comments are closed.